LA Film Festival: Opening Night, Music Videos and Indie Pilots Announced! Today we’re beyond thrilled to announce the Opening Night film of the 2018 LA Film Festival: Andrew Slater’s new documentary Echo in the Canyon—an in-depth chronicle of how groups like The Byrds, Beach Boys, Buffalo Springfield, The Mamas & the Papas and more gave birth to a musical movement that still endures to this day. Also announced was the Festival’s Premieres slate, Music Video program, Future Filmmakers showcase and Indie Pilots. We’ll be talking more about our Future Filmmakers in a future blog post, so for now let’s get to meet our Premieres, Music Videos and Indie Pilots. Rock on! New movies that you’ve never seen before, some with familiar faces—from the icy floes of upper Siberia, to high school hallways, to the backseat of an unlikely rideshare adventure, these tales are sure to thrill, inspire and mystify. I want my… LA Film Festival? That’s right! This is the section’s debut, celebrating the marriage of music and visuals with 21 new, groundbreaking works. Apartment – USA (DIRECTOR Ellis Bahl) – A sultry performance inside an infinity tunnel composed of black and white televisions. Bones – USA (DIRECTOR Hunter Brumfield) – In a health spa for the older crowd, two women leave their “sitzercise” group to be with one another. Camisa Al Reves – USA (DIRECTOR Andrew Vasquez) – A VHS tape, an early ‘90s quinceañera, a wrestling match and a Mexican Banda music video equal a lot of nostalgia. Clutch – USA (DIRECTOR Christopher Ripley) – A professional athlete’s rise and fall from grace. 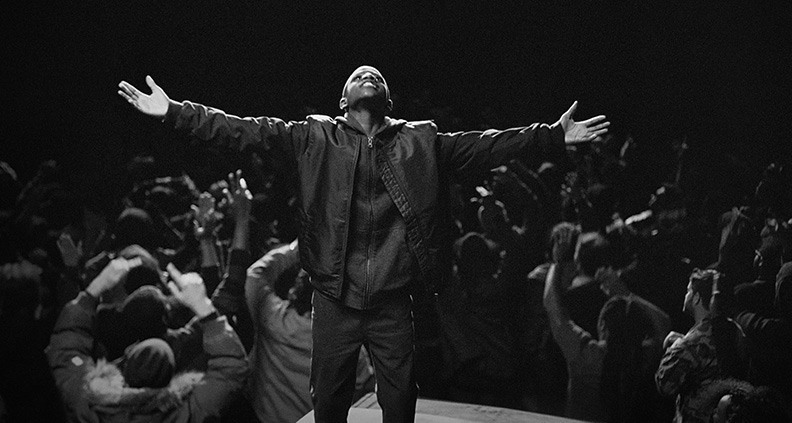 Dis Generation – USA (DIRECTOR Hiro Murai) – Black and white visuals set the scene for this A Tribe Called Quest tune. Dreams – USA (DIRECTORS Elliott Sellers and Erik Ferguson) – Naked bodies gyrate and collide in a rave-like setting. Found – USA (DIRECTOR rubber.band) – On the verge of death, a man goes back to see the woman he loves. Half a Million – USA (DIRECTORS Lamar + Nik) – Created with 5,566 stickers and hand cut from the 4,868 frames, The Shins turn up in the most unexpected places all over the city. Hard World – USA (DIRECTOR Mike Hollingsworth) – Happy Foot/Sad Foot, the iconic Silverlake duo, get the movie treatment as we follow them through a day in their lives. Heart Attack – USA (DIRECTOR Mimi Cave) – With paper bags over their heads, a group of people move almost uncontrollably through various locations. Indie – USA (DIRECTOR Angel Kristi Williams) – Baltimore sets the scene for this ode to black women and black men. I Want You – USA (DIRECTOR NORTON) – As a coroner works the night shift at a morgue, the beat of the music makes dead bodies erupt in dance. Land of the Fairies – Israel (DIRECTOR Amiel Kestenbaum) – In a magical handcrafted world, we follow a young boy’s enchanted journey after a fairy who leads him from one extraordinary world to the next. Lost Angeles – USA (DIRECTOR Evanston Moore) – A man is transported all over Los Angeles while singing about trying to find his place in the big city. Loving Is Easy – United Kingdom (DIRECTOR Chris Ullens) – Miniature Rex and Benny chill and perform together in stop-motion in their dreamy living room that comes to life to the sound of their lovely tune. My Way – USA (DIRECTOR WATTS) – A battle between the pink posse and the gang of blue happens at a dinner party. Pleader – United Kingdom (DIRECTOR Isaiah Seret) – Doom is on the horizon in this Welsh mining village but the birth of a child could save their valley from destruction. Side by Side – Czech Republic (DIRECTOR Bohdan Zajcenko) – A man drives into the forest and pulls his bride out of the trunk. What happens next is anyone’s guess. Terraform – Spain (DIRECTORS Sil van der Woerd and Jorik Dozy) – The true story of the hardships and sacrifices that sulphur miners make in order to provide for their families in Kawah Ijen, Indonesia. True Love Waits – Israel (DIRECTOR Adi Halfin) – A poignant tale of loss and loneliness through dance. Each of these three pilots stand on their own and navigate a full hour of an episodic show, showcasing the talents of Storytellers who bring an independent sensibility to their original series. Also announced were the 15 shorts consisting of this year’s Future Filmmakers program, made by an accomplished group of high school filmmakers from all across the country—even internationally! Of the films, 43% were directed by young women and 47% directed by filmmakers from diverse backgrounds. Feeling overwhelmed yet? Don’t worry—you have eight whole days to work your schedule-making jujitsu to try and catch as much as possible. And as of yesterday, you have even more ways to do so. For Film Independent Members, sales of general admission tickets to individual film screenings began Tuesday, August 14. Individual tickets will be made available to the general public starting August 21. 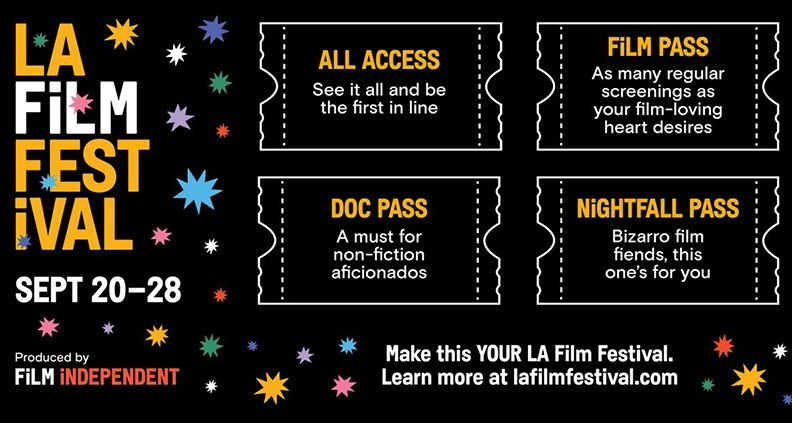 Visit tickets.lafilmfestival.com and be sure to follow the 2018 LA Film Festival on Twitter, Facebook, Instagram and YouTube. Presenting Media Sponsor is Los Angeles Times. Official Host Venue is ArcLight Cinemas. Platinum Sponsors are American Airlines, EFILM | Deluxe and HBO. The University Sponsor is Loyola Marymount University School of Film and Television. Venue Partner is Wallis Annenberg Theater for Performing Arts. Festival Supporters are Directors Guild of America, eTech Rentals, Kona Productions, TREETI and Visit Seattle. Festival Affiliates are 21st Century Fox Global Inclusion, ATK Audiotek, Konsonant Music, SAGindie and Writers Guild of America West. Additional support provided by National Endowment for the Arts. Stella Artois is the Official Beer. IMDbPro is the Official Industry Resource. CITI is the Official Credit Card. The LINE, NoMad Los Angeles and Freehand LA are the Official Hotel Partner. Essentia Water is the Official Water. Hillersden Estate Wines is the Official Wine. Getty Images is the Official Photographer. Here are the Winners of the 2018 LA Film Festival!